Space scientists will redevelop BT's historic Goonhilly satellite station in Cornwall to allow communication with missions to Mars, it is revealed today. The mothballed site will also become a centre of cutting-edge astronomical research as part of a network of huge radio telescopes. Arthur, the world's first parabolic satellite comms dish. BT finally shut down most operations at Goonhilly in 2008. 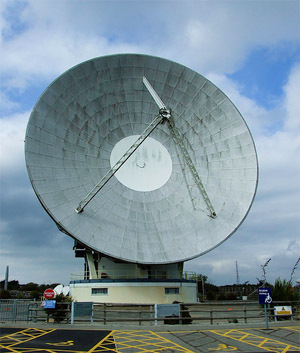 The first dish, Grade II-listed "Arthur", was built in 1962 to communicate with Telstar, which relayed the first live transatlantic TV broadcasts. The new deal sees the creation of a new company, Goonhilly Earth Station (GES) Ltd, set up by Orbit Research Ltd and Oxford University. Qinetiq, the UK Space Agency and the International Space Innovation Centre are also backing the project. Although they have plans to redevelop the vistor centre and launch community outreach programmes, consortium's first priority will be to upgrade the site's antennae for deep space communications and radio astronomy. "We have plans to go one stage further [than before] and to use the antennas at Goonhilly to support space science missions to the Moon, Mars and beyond," said GES chief executive Ian Jones. Goonhilly will be linked with the famous Jodrell Bank site, near Manchester, for radio telescopy, forming what is hoped will act as a stepping stone in the development of the Square Kilometre Array, a European plan to build the world's largest telescope in the southern hemisphere. "Goonhilly telescopes can also be connected to global radio astronomy networks that will eventually include the Square Kilometre Array," said Steve Rawlings, professor of astrophysics at Oxford University. "The Square Kilometre Array will attack truly fundamental questions: the origin and fate of galaxies, stars, planets and life; and the nature of the fundamental laws of the Universe, going beyond Einstein into the biggest unsolved problems like dark energy and quantum gravity." The UK space industry has been a rare high technology success story in recent years. According to a report in November by the Oxford Economics consultancy, it has grown by 10 per cent annually since 2007, to £7.5bn, and provided 15 per cent more jobs each year. Local MP Andrew George today called for the government to also back the Goonhilly project. "There is still much more work to be done to bring this project online," he said. "Government support will be crucial. It already has the backing of the private sector."